There are customs and events every season in Japan. One of the customs that represents autumn, there is “JUGOYA” and “OTSUKIMI”. 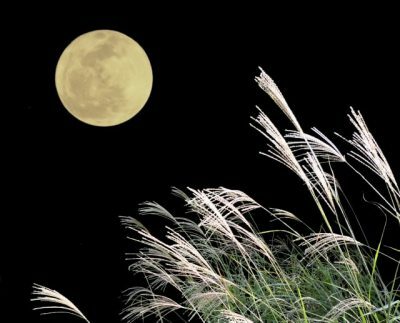 Since ancient times, Japanese have a custom of viewing the moon and praying for happiness. “Jugoya”(十五夜) means the full moon in mid-autumn. The word〝十五〟 literally means 15, and 〝夜〟means night. It is represented like this because it takes about 15 days from the new moon until the full moon. The moon which you can see on Jugoya is called “Chushu-no-meigetsu” which means “Mid-Autumn moon”. Originally, Jugoya was the 15th of August on the lunar calendar, but it is now around mid-September to early October according to the solar calendar. This year’s full moon night comes on Monday, 24th of September. There is a theory that the origin of Jugoya was transmitted from China. During the Heian period (794- 1185) in Japan, nobles enjoyed beautiful moon and started a party. This is the beginning of the moon viewing, so-called “OTSUKIMI” （お月見） in Japanese. It refers to events that appreciate the moon on Jugoya, that is, August 15th in the lunar calendar. In the Edo period (1603- 1868), the moon became familiar to the common people as a good auspicious symbol. From this, on the Jugoya when the full moon is seen most beautifully in a year, people have customs to appreciate the harvest of agricultural crops in autumn, and to pray for the rich harvest of rice since then. By eating the offering after viewing the full moon, it is thought that from the moon the rich harvest of the year, health and happiness will be brought. This is also said to be an act to thank the ancestral connection. 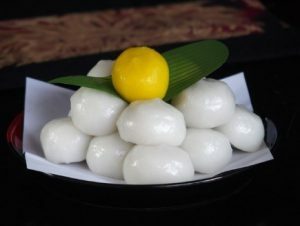 As offering for the moon viewing, it is traditional to prepare agricultural crops such as rice dumpling with sweat beans inside, Japanese Silver Grasses (because it resembles rice horses, it is served praying for the rich harvest of rice) and taro (served with gratitude for harvesting of potatoes). It is said that health and happiness can be obtained by having a round shaped dumpling just like a moon and eating it. Besides that, the round dumpling represents the full moon, which is also a symbol of appreciation for the autumn harvest. ☆彡By the way… have you ever seen a rabbit in the moon? 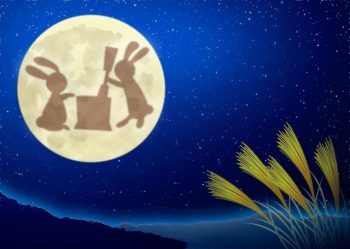 In Japan, it is said that there are rabbits in the moon. This is because the shape pf moon’s crater looks like a rabbit pounding rice cake with a (wooden) millet in a mortar. What you see in the moon varies from country to country. In one country there are lions in the moon, in another country you may see a woman turning sideways, a big scissor crab, and so on. Depending on the traditions and customs of the land and from which direction you look at the moon, what you see in the moon will change.